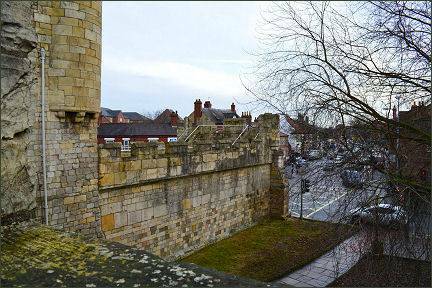 Walmgate Bar is the most complete of the four main medieval gateways to the city, situated on York's city walls, the most complete example of medieval city walls still standing in England today, the walls extend for 2.5 miles, enclosing a total area of 263 acres. 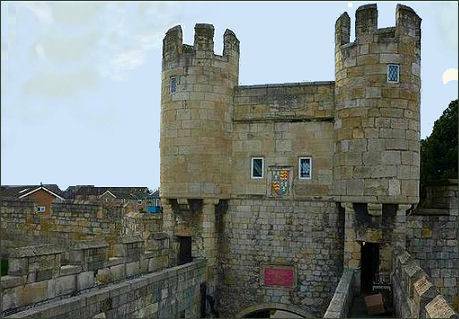 Walmgate Bar is also the only one of the bars on the city walls where the barbican, portcullis and inner oak doors have survived to the present day, it is the only town gate in the country to retain its barbican intact. The bar has 3 storeys and is 6.5 metres in length. The oldest part of the structure is the stone archway which dates back to the twelfth century, the walled barbican at the front of the bar dates from the fourteenth century, the wooden gates are of fifteenth century date. The timber-framed and plaster building on the inside dates from the sixteenth century and replaced a fourteenth century structure. Local artist and historian John Browne (1793) was born there, it is now used as a cafe which serves refreshments. The first mention of the bar occurs in mid twelfth century document which refers to the building as 'Walmegatebarr', details of tolls collected here in 1280 have also survived. Walmgate Bar was burned by rebels in 1489 during the Yorkshire Revolt against the heavy taxation of King Henry VII, the first Tudor king, when the rebels burned the gates of the bar following the murder of Henry Percy, 4th Earl of Northumberland, who betrayed King Richard III at the battle of Bosworth Field in 1485 by remaining inactive and submitted to the new king, Henry VII, after the battle. The Earl came to deliver the King's demand and collect the taxes, however, on the 28th of April, 1489, at a meeting he had arranged with them to discuss their grievances about the taxes, an angry mob, led a man called Chambre, claimed that Henry's predecessor, King Richard III, who was popular in Yorkshire, would never have allowed his people to be oppressed by such a heavy tax, and that the Earl was a 'scurvy rogue'. The mob of angered citizens attacked the earl, who was then "furiously and shamefully murdered and killed" as they tore him apart. 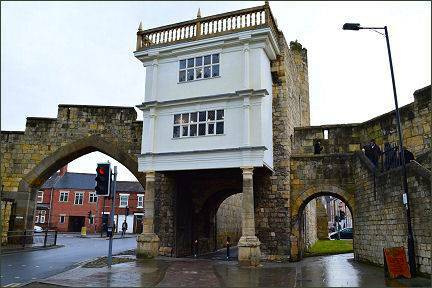 During the Civil War Siege of York in 1644, fought by Scottish Covenanter Army and Parliamentarian armies against the Royalist Army under the Marquess of Newcastle, Walmgate Bar bore the brunt of the Parliamentarian attack. A battery of guns was set up on the nearby rise of Lamel Hill, they also dug a mine beneath the Walmgate Bar barbican. The cannon caused scars in the Bar which are still visible today, and ruined and many domestic buildings in the area. A deserter warned the Royalists about the mine, and they successfully flooded it through a countermine. Records state that Sir James Lumsden's Scottish detachment got inside the outer gate and damaged the then iron gates inside, but there is no mention of a breach of the inner gates. The siege lasted from 22 April until 1 July when the city was relieved by the Royalist commander Prince Rupert of the Rhine. 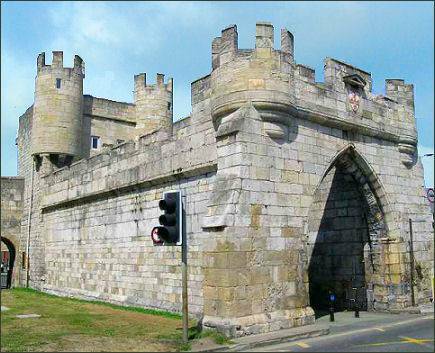 Walmgate Bar was restored and an archway to the side was added in 1840, another gateway was added in 1862.